Recently we had to clean the lotus pond at Jiwa Damai, since it was overgrowing with weeds. Aitor and Justin, our two volunteers, as well as Wira, Jiwa Damai's coordinator, were getting ready to get into the mud of the lotus pond. To avoid possible skin irritations they covered their legs with large plastic bags, which are held at the top of the legs with tapes. However once they were in the pond, they found the mud quite agreeable and liked to walk and work in it, more like a mud bath. After we had to rebuilt our high pond, the water quality left to be desired. Emptying the pond, we had lost all the EM which had settled in the nooks and crannies of all the stones. In order to get back to the old clear water we now treat the water with liquid EM (effective microorganisms). Each day a few drops dripping in, slowly but continuously. The Bokashi Balls are made of clay and EM. The microorganisms like to settle between certain type of stones.So we distributed about 500 balls, all handmade under the stones in the water to allow the organisms to settle again. It reduces the moskitoes as well as keeps the algae growth in limits. So now we hope to welcome back the diverse aquatic life and beautiful water lily’s! An important part of the recycling process is the composting of organic materials. 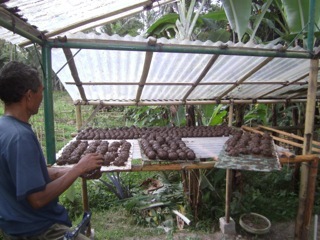 We use cow dung, leaves, fruit and vegetables left over, wood, dust etc. and add effective microorganisms (EM technology) in order to produce a healthy fertilizer. The effective microorganisms are produced in this blue container. The fertilizer, made from our compost is used for the entire organic garden. Next to the compost it is our worm factory. The worms like to eat fruit and veggies. They don't like spicy and acidic foods, such as lemons or chilis.